Well, hello again! I returned from my travels a couple of weeks ago, and have finally managed to get back into my "normal" routine, so that means back to posting on Tiny Aviary. Fall is a busy time of year for Chicago area birders (and birds!) as so many species are coming through on their way south. While walking my trusty greyhound, Seth, one morning last week I saw my first Yellow-bellied sapsuckers. I've seen plenty in the prep lab at the museum, but this was my first time seeing them live and in the field. More about that in another post. I want to start things off again by talking about a show that a friend of mine is organizing to benefit Kentucky hemlock forests. Ancient hemlock forests in areas such as the Smokey Mountains, and the Shenandoah valley are rapidly being turned into graveyards of dead trees by a species of insect introduced to the States decades ago; the Woolly Adelgid. The adelgids feed voraciously on hemlock needles and reproduce rapidly throughout the warm seasons. The infestation and devastation of eastern hemlock forests is being compared to chestnut blight and the *extinction of the American Chestnut tree. The first sighting of the Woolly Adelgid in Kentucky was in 2006. Since then a new organization was formed, Save Kentucky's Hemlocks. The show will directly benefit this group. There will be original work by a wide range of artists (including yours truly) available for sale, as well as live music. 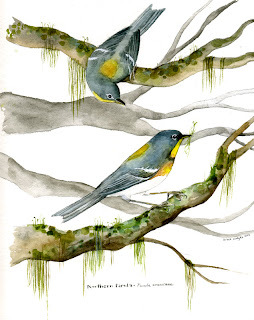 I was asked to make a watercolor of a species of bird that is closely associated with Kentucky hemlock forests. Many species depend on hemlocks, but Northern Parulas, and Black-throated green warblers in particular. Right now I don't have specifics for the show (date, exact location etc.) , but as soon as I do I will post that information. *since 2005 a few mature American Chestnut trees have been discovered, the locations of which are often kept secret. For more information visit the American Chestnut Foundation. Welcome back! Looking forward to hearing about the Euro tour. It's good to see you back online. I'm sure Europe was a hoot. Thanks guys! It's good to be back. I missed looking at your amazing work!